The show may be over, but you're not done with Westworld. No, you've downloaded the game to continue your obsession. 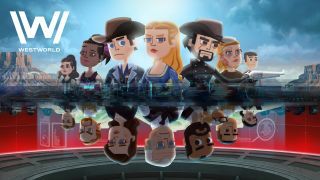 But it's complex, and tricky, and you need Westworld mobile game tips right now. After all, you might spend all the most valuable currency up front. You might be lost for hours without figuring out how to rank up Hosts. You might need more coins fast, or need to know how Reveries actually work. Or you might just want to know how to stop the game freezing. Well, we can't help with that last one, but we DO have 11 essential Westworld mobile game tips to help you build a better park, keep Guests happy, and never run out of those cheeky green gems. Well, maybe never is a strong word... Either way, here are the best tips for thriving in your own personal Westworld. And if you're looking for coverage of the actual Westworld show... here's our Westworld season 2 review. And here are the 10 biggest questions we have after watching the Westworld season 2 ending. The currency you absolutely need to keep an eye on in Westworld is the Green Gems. How do you get more Green Gems? Well, you get some for levelling up (five each time), and you can have Ford manufacture them once you’ve unlocked his office at level 9. You also get green gems from completing challenges, doing daily tasks, and going on Journeys from Sweetwater. Very, very occasionally you’ll get them from Host interactions. If you get the opportunity to get green gems, take it, at the expense of almost anything else. Green Gems can be used for a number of things, but you should save them for the essential stuff. If you can avoid it, never use green gems to rush actions - you rarely need to have something in a hurry in the Westworld game. What you should save them for is unlocking Premium Host tokens in manufacturing, and for expanding the number of slots you have in each of your Delos control rooms. See the little gem icon at the bottom of each room? Tapping that spends gems to unlock more slots within that room - very handy for expanding areas like Diagnostics. Of course, you can always pay real money for Green Gems but… that isn’t why you’re here. Sweet god, you need to know this, because the game isn’t going to tell you about it. So, this is how the Rebuild station actually works. First off, you add a Host that you want to level up. Once that’s done, you can add up to four other Hosts to sacrifice permanently, which will give your original Host an XP boost. When a Host reaches maximum level - as indicated by a little ‘Max’ on their profile - you’ll have the option to level them up. You do this by putting them into the Rebuild station and sacrificing two Hosts of the same level. So, if you’re looking to boost your Host from a two-star to a three-star, you need to max out their XP and then sacrifice two more two-star Hosts. Plus a load of coins, but you can always get those back. Upgrading your Hosts is VITAL. You won’t be able to entertain guests in areas beyond Sweetwater unless you have two-to-five star Hosts, and the game never tells you how to actually create them. Sure, you can occasionally get lucky and build two or three star Hosts from a random Host token in Manufacturing, but this upgrading process is essential to proceed. With that in mind… you should build as many Hosts as you can. During our extensive play with the game, we never came close to running out of coins, so filling your park with Hosts and then using them to level-up other Hosts is absolutely the way to succeed. The more demanding Guests in the Abernathy Ranch onwards will expect you to have powerful Hosts to entertain them, and will reward you with heaps of coins, so make sure you build new Hosts when you can, and continue to use them to boost your more powerful ones. You’ll quickly discover that trying to entertain a Guest with an underpowered Host is a total waste of time. So, if you look to match them and you have a red stat in the skill the Guest requires… don’t even bother. Just leave the Guest where they are. Any Host who fails to get an entertainment rating of 50% or above will be gunned down by the Guest, leaving you with an expensive cost in Synth Blood. And you’ll get no coins or other rewards. Just don’t do it. You’ll quickly unlock the majority of Westworld simply by playing the game for an hour or two. And while it’s tempting to rush out to Escalante and explore, it’s actually a bit of a waste of time. Until you build up a decent number of three-star Hosts (or above) you won’t be able to entertain any Guests in these regions, because they’ll be too demanding. You need to stay in Sweetwater at the start and grind your Hosts up to maximum level, upgrade them, and once you have a decent number… then you can tackle the newer areas. VIPs like The Man in Black offer decent rewards, if you can entertain them. However, doing so is tricky, because they’re often more demanding than other Guests, so only your highest level Hosts will be up to the job. Save the freebie Premium Hosts you get at the start - like Teddy and Lawrence - to entertain VIPs when they’re in the park. They only stay for a limited time, so you don’t have long to get the rewards from them. Don’t stress about VIPs, however, as ignoring them won’t have severe consequences, certainly not at the start of the game. As coins are rarely in short supply, you should always look to upgrade your park buildings. Doing so will give you rewards via the Objectives menu, and you’ll also get a wider variety of goodies for entertaining Guests within them. Buildings at max level could even grant green gems from Host interactions, which is absolutely what you want. You need to speculate to accumulate in this game. When you get deeper into the game you’ll be able to craft props to enhance the skills of your best Hosts. These are a great way to expand their skillsets, and make them more versatile, meaning you’ll have more options for your most powerful Hosts successfully entertaining Guests. There are a limited number of props to choose from, but you can craft them up to five levels each, making them increasingly potent as you go. Getting materials is a pain, however, as you need to interact with the stores in Escalante and they’re very demanding. And don’t forget that a failed session with a tech in Escalante will also result in your Host getting killed, so don’t assume it won’t happen. Generally speaking, the banter from the human characters who talk you through the game is all just flavour. They’re rarely giving you genuinely useful information, so don’t worry about trying to work out what they want from you… usually, it’s nothing. Full disclosure, we haven’t worked out what the ‘glitch’ in the system wants from us, so that may change things in the end game. Make sure you give all your Hosts a chance to interact with Guests. It’s tempting to just let your most powerful Hosts do it every time, as you get more coins and XP, but levelling up your weaker Hosts via interactions means that they’re more valuable when you sacrifice them in the Rebuilding station. And while the game does make it very clear, you really should diagnose your Hosts as often as possible - anything with a flashing yellow bar should be considered priority. Fixing a glitched Host after the event takes much longer than diagnosing them before. 11. How do Reveries work best? If you're a few hours into the game, you'll have unlocked Reveries. At first glance they seem like a great way of upping your Hosts' stats, but the multipliers they offer are tiny at first. You'll only get a few Reveries at first, so be careful who you apply them to. Level them up as much as you dare (failing doesn't destroy the Reverie, but you do waste coins), then add them to your highest-ranked Hosts first. Which ones should you apply to which Hosts? If you check out the Host Attributes menu, you can see what skill your chosen Reverie influences on a Host. It sounds obvious, but there's no point adding certain Reveries to a Host if it has no impact on their skills, so always check before you apply them. As with anything, the Reveries are about gaining small, incremental additions to your Host stats, so they're well worth investing in, especially if you're going to tackle areas beyond the Abernathy Ranch.